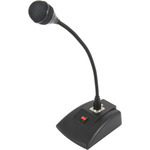 This low profile ceiling or panel mounting boundary microphone has an omnidirectional pick-up pattern which is suitable for use where discreet audio surveillance is required. Applications range from audio pick-up in induction loop systems to audio monitoring and recording for CCTV systems. 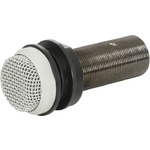 A gooseneck condenser microphone with selectable chime function. Microphone connection to the base is via XLR and output is on XLR at the rear. 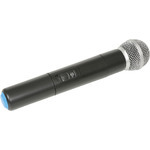 Power is provided to the microphone capsule either from 2 x AA batteries in the base or from 5Vdc via the supplied USB lead. The base is also home to a latching paging button on top and a chime section on the underside. DIP switches offer a selection of chime settings, governed by a rotary volume control. 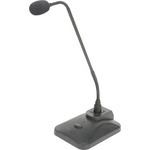 Designed for remote paging and announcements. 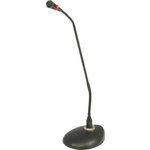 Paging microphone with gooseneck stem and dynamic capsule supplied fitted to a desktop base with latching on/off switch. Connection to base is via balanced XLR and output from base is also via balanced XLR (not supplied) for connection to mixer or mixer-amplifier in a public address system.